New Opportunities for New Americans - CooperationWorks! For the past three years, the Cooperative Development Institute (CDI) has been working with several groups of New American farmers to form cooperative farms in Maine and New Hampshire. Many recent immigrants to the Northeast are fleeing violence and political persecution in their homelands to gain safety and economic opportunity in the U.S. They face significant barriers here. Somali Bantu refugees first started coming to Maine over 15 years ago and resettled in Lewiston and Portland. This traditional farming culture sought to use their farming skills in their new home in Southern Maine, but struggled with learning a new language, accessing land, and understanding the American agricultural market. CDI is committed to transforming ownership of our food economy so that all people can meet their basic needs including access to healthy local food. The New American Sustainable Agriculture Project was launched by CEI, an economic development organization, and in 2009 became a part of Cultivating Community, a local agricultural organization. 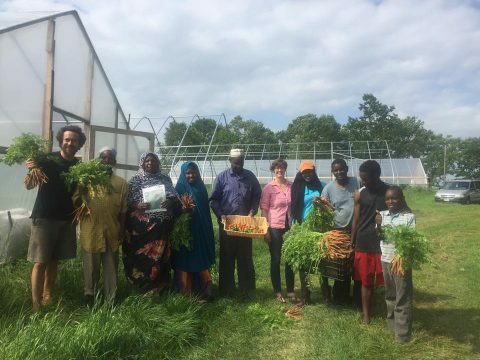 This project provides training, land access and market access for Somali Bantus and other New American farmers. After a number of years in the program, some of the farmers sought to expand onto their own farmland so they could grow their business and establish their own roots. Through CDI’s relationship with Cultivating Community, we met these farmers in 2015 and learned about their interest in farming together. After we shared the cooperative model with them, they decided to pursue a cooperative and CDI helped them develop their organizational and operating structure. Last August, New Roots Cooperative Farm became the first New American-owned cooperative in Maine, incorporating a producer cooperative with four farmer owners. Alongside CDI’s work with New Roots, Maine Farmland Trust and Land for Good worked with the farmers and Cultivating Community to identify farmland where these farmers could establish a new farm. In 2016, Maine Farmland Trust purchased Gendron Farm, 30 acres of an old dairy farm in north Lewiston, so that they could lease the farm to New Roots with an option to purchase. CDI also worked with the farmers to develop their business plan and a marketing plan. That business plan was used to help New Roots raise over $100,000 in loans, grants, and donations from the Cooperative Fund of New England, individuals, the USDA, Broad Reach Fund, New England Grassroots Fund and a crowd-sourced funding campaign. In 2017, New Roots Cooperative Farm became operational with 5 acres under cultivation, a 120 person CSA and wholesale markets at food pantries, a food hub and restaurants. In New Hampshire, CDI has been working with Organization for Immigrant and Refugee Success to establish the New Americans Farmers Cooperative. Like New Roots, these nine farmers participate in an incubator farm program, this one outside of Manchester, NH. Their cooperative consists of Somali Bantus, Congolese, and Bhutanese farmers who have established their farm businesses on the incubator farm. CDI has worked with ORIS staff to develop the cooperative structure and business plan. The farmers have started to take over operations from ORIS and will are building shared marketing through a CSA and wholesale. CDI is committed to transforming ownership of our food economy so that all people can meet their basic needs including access to healthy local food. We’re excited to see New American cooperatives sprouting up in the Northeast that are helping farmers meet their needs for access to good farmland and markets that can support their economic security, fulfilling the promise of America as a place to rebuild their lives.